The following paragraph is an almost exact copy and paste job from the article posted earlier this morning looking at Group Ten Metals, in order to save time, and we will look at the detail differences on the charts for Metallic Minerals below. Metallic Minerals is part of a triad of companies run or owned by a guy with a stellar track record in the business, which is known as The Metallic Group Companies, the other two companies being Group Ten Metals, which is also a strong buy right now, and which we looked at earlier today, and Granite Creek Copper (GCX) which is cheap and looking attractive here too. 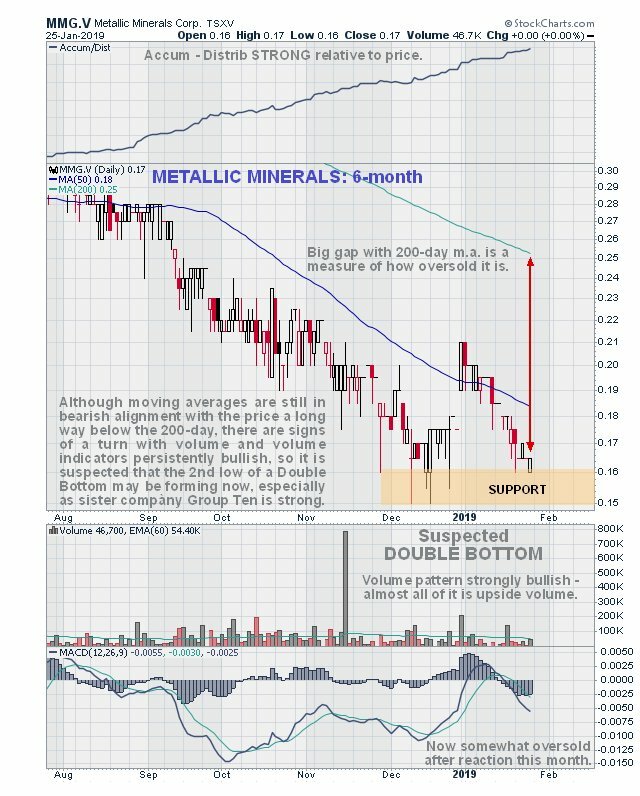 The reason that both Group Ten and Metallic Minerals have remained so depressed even in the face of a persistently strong volume pattern and volume indicators is of course the ongoing weakness in metals prices, but with that set to change, they look like they will both be let off the leash soon. The recent weakness in the price of these stocks is certainly not due to the number of shares in issue, since Group Ten has 57.5 million shares in issue, and Metallic Minerals 65 million. Although Metallic Minerals has not staged a clear breakout as related Group Ten Metals did late last month, it did “give it a go” at the same time, but has since slipped back to lose all of the gains. However, that move is not regarded as a failed breakout, but as a preliminary breakout, which is a much more positive interpretation which implies that we will soon see “the real deal”, and there are plenty of grounds for such optimism as we will now see on the charts. On the 6-month chart we can see the “preliminary” breakout late last month at the same time that Group Ten actually did break out, and we can also see that the subsequent retreat has brought it back close to support at the December lows, where there is good reason to believe that it is now marking out the 2nd low of a Double bottom, and if this is the case then we are clearly at an optimal entry point right now. Bullish factors that strongly support the stock taking off from here include the volume pattern which has been bullish for many months, and the continually rising Accumulation line, which is extraordinarily positive and suggests that Metallic Minerals could have a really strong run when metals prices improve, as they look set to soon. The stock is now rather oversold on its MACD and quite heavily oversold relative to its 200-day moving average, both of which factors providing upside potential. 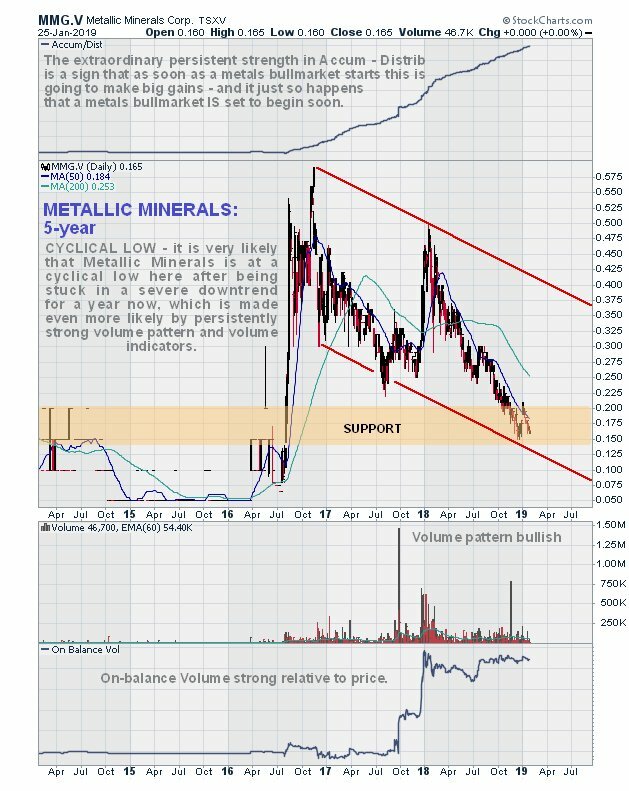 On the long-term 5-year chart we can see that Metallic Minerals looks like it is at a cyclical low here after a persistent year-long downtrend has brought it back to the lower boundary of a giant downtrend channel and to a zone of quite strong support above the earlier base pattern, with the Accumulation line marching ever higher a strongly positive background factor in play that promises a major bullmarket in this stock. The conclusion is that Metallic Minerals is at or very close to an optimum buy spot here and is accordingly rated an immediate strong speculative buy. The stock trades in modest volumes on the US OTC market and there are 65 million shares in issue. Metallic Minerals Corp, MMG.V, MMNGF on OTC, closed at C$0.17, $0.126 on 25th January 19. Posted at 8.55 am EST on 28th January 19.